The sun can be a huge productivity multiplier. By using the SODIS (short for SOlar DISinfection) method of water treatment, you can put the sun to work for you while you go about the other tasks required for your survival. Solar Water Disinfection sterilizes the water, meaning that it kills live pathogens. It works by exposing pathogens to lethal doses of UV radiation from the sun. It does not remove chemical contaminants. It does not improve the taste of the water. Collect water in containers no larger than about 4 inches thick. A standard 2-liter soda bottle is fine. Containers must be clear; not colored, and not opaque. PET is preferable to glass because it is lighter and resists breakage. Place the filled, closed container in the sun for 6 hours. 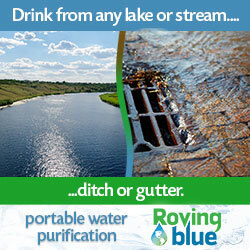 The water is then safe to drink, provided it is not contaminated with chemicals. If the water is too turbid (cloudy) this method will not work as well. To test, place a newspaper headline-sized font on the ground, and place the bottle full of water on top. Look through the opening of the bottle. If you can read the headline through the water, it is clear enough to sterilize using SODIS. Otherwise you’ll need to filter the sediments out of the water first. Be sure the bottles are lying down, not standing vertically, to expose the greatest amount of water to the sun’s rays. If the sky is less than 50% cloudy, 6 hours are enough. If it is more than 50% cloudy, leave the bottles in the sun for two days. If it is completely overcast or raining, don’t rely on SODIS; collect rainwater or pasteurize groundwater instead. Ideally, you should place the bottles in a hot place; on a roof, on a sheet of corrugated metal, or on asphalt or dark rocks. If these are not available, at least try to shield the bottles from cooling breezes, but don’t shade them. Store the water in the container in which it was sterilized to prevent recontamination. If you must transfer the water, be sure the storage container is itself sterile. You can sterilize storage containers if they are clear by placing them closed in the sun for six hours or by washing them thoroughly (and triple-rinsing with agitation) with sterile water. Sterilized water can be stored indefinitely in a cool, dark place. Exposure to light might encourage the growth of algae, but this is not a health hazard. PET breaks down in the sun, so you eventually have to replace the container. Replace cloudy, scratched, or leaky containers. Do not use PVC containers except as a last resort. PVC leaches chemicals into the water, especially when placed in the sun. The following symbols indicate a PET container. But note that these symbols are not always used on PET containers, and the symbols are not consistent around the world. PVC containers have a bluish tinge, especially at the seams. You can test an unknown container to determine whether it is PET or PVC by burning it. PVC smells acrid when burning; PET smells sweet. PVC is more difficult to burn than PET, and will not keep burning when removed from the flame. All of these symbols indicate a container made from PET. Not all PET containers have a symbol, though. SODIS Factsheet, Glass vs. PET — addresses the pros and cons of using glass or PET. SODIS Factsheet, Bottle vs. Bag — addresses the pros and cons of using bottles and bags. SODIS Factsheet, Turbidity — practical ways to deal with turbid water. SODIS Factsheet, Cloudiness — dealing with suboptimal conditions in the field. it says right at the begining of this film not to try and do anyting in the film and it is for entertainment puroses only. I guess it is totally bogus, and I wouldn’t try it any way. it doesn’t make sense.